One of the keys to running a business well is having visible oversight—the high-level, future-focused information that allows for continued success. In joint use, that means reviewing your contracts to ensure they are updated, correct and working in your favor. Joint use contracts are complicated things—knowing whether you are charging (or paying) the right rental fees or staying on top of permit to attach fees via the agreed-upon terms hinges on comprehending that stack of paperwork. You simply cannot enforce terms you do not understand. Alden Product Manager Dianne Costello has seen many joint use contracts in her career. She suggests that before jumping into the legalese with both feet, joint use departments should give their contracts a quick glance to see where things stand. Here is her go-to checklist for speed-reading contracts to determine if further analysis—or renegotiation—is needed. First, ask yourself, "Are there defined dates at all?" When did the contract go into effect? How long is the contract valid? If so, are there terms that need to be followed for auto-extension? Do the rates match what is reflected in the contract (or amendments to the contract)? Are there guidelines for calculating rates or about how often they can be changed? Next, take a quick look at the fees mentioned. 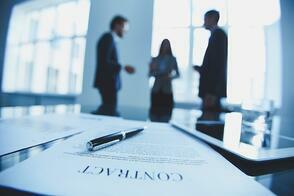 Does the contract note administrative or application fees? Guidelines for recapturing engineering or make-ready fees? Defined timeframes as to when someone is in violation? Defined rates that can be collected when a violation is identified? Have recurring rentals changed on an annual basis or have the same number of poles and the same rate been charged for years? Does the contract mandate that attachers participate in an inventory or define what types of attachments are allowed? Does it state how often an inventory must take place? What about administrative field practices? Does the contract address field practices, identify minimum standards and/or note who is responsible for upholding them? Does it note how communication with attachers is handled? As a pole owner, are you billing for everything you should be, including fines, penalties, fees and rentals, and timeframes identified for payables and receivables? As an attacher, are you being billed for what the contract allows and nothing more? Does the contract say anything about dispute resolution? Finally, after looking at a few, can you say that your contracts meet your needs and expectations? Are there more commonalities between your attachers or more exceptions in your contracts than is standard? Did you answer "no" more often than "yes"? If so, it is safe to say that based on the state of your joint use contracts, you are more than likely ready to start contract renegotiation. Get going—that stack of paper is not going to change all by itself. In joint use, the contracts between attaching and pole-owning entities are your bond, providing valuable ground rules and protections for mission-critical relationships. Are your contracts in need of a good once-over? Download our 5 Reasons to Review your Joint Use Contracts Now tipsheet to confirm whether the time is right for your organization.